Alpla, who is the leading company in development and production of plastic packaging solutions worldwide, produce thousands of packaging items for a wide range of industries. The company was formed over 60 years ago by two brothers, Helmuth and Alwin Lehner with the original founding name known as Alpenplastik Lehner Alwin GmbH in Hard. Alpla has 176 locations worldwide, in 45 countries and across 4 continents, which includes the project location of Warrington, England, where the development took place for the new flooring. The client, Alpla contacted us about replacing their existing flooring in their Warrington production facility, which needed to have a hard-wearing professional flooring in place, ready for long-term use. Over the years, the flooring within the facility had just consisted of a concrete slab which was previously painted over in various colours. We were asked to install new flooring which was hardwearing for machinery such as forklifts etc to operate on and able to withstand long-term use. The existing procedures for updating the floor was only sufficient for the short term. Sikafloor helped us supply a solution when our Alpha got in contact. We began work during the 2017 Christmas shut down period for the new development within the production facility. A brand new 2,200m2 floor was to be installed over this period of time. The flooring we installed was Sikafloor 263SL but before this could be done we needed to carry out other procedures including the removal of the previous coating of paint and removing any contamination. This involved us utilising our ScanMaskin SC1000 remote control grinding machine to then clean the concrete slab which was assessed to move onto the next stage of applying the resin primer. Sikafloor 263SL, is known for being a two-part, multipurpose binder bae on an epoxy resin. It is also good for mechanical and chemical resistance as well as pertaining an easy application, being water resistant and highly fillable. 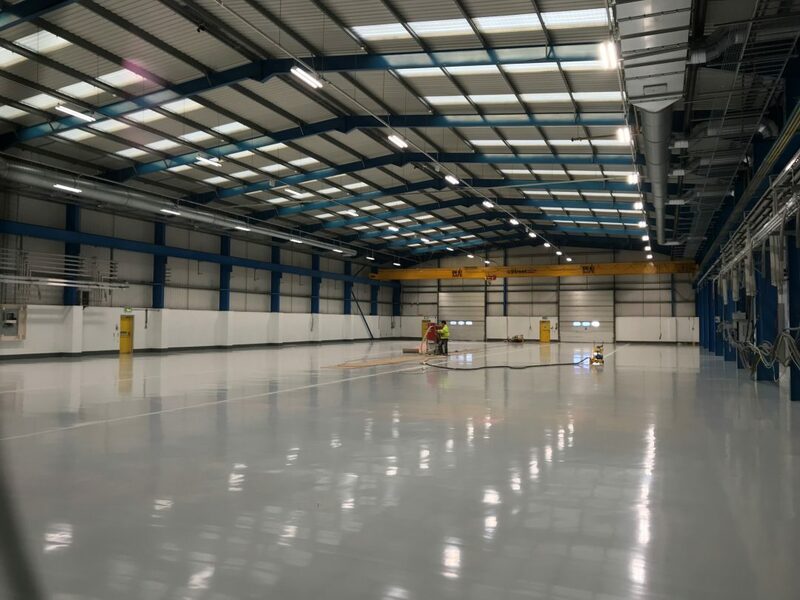 The flooring, which is a type 5 epoxy self-smoothing resin floor was laid at 3mm thickness and was installed in RAL colour 7035 which provided our client with a very bright and appealing finish. The refurbishment involved in this project was carried out over the Christmas shut down period where the work could take place without affecting the daily routines of the facility. The project was carried out in several stages ensuring that all appropriate measures were taken which helps us provide our clients with a high-quality flooring solution. Stages included the initial stage carried out was to remove the previous coats of paint which had been applied over the past year few years. Once completed, our clients were very satisfied with the final result. The main flooring was installed within the facility however we managed to turn it around in time, alongside re-cutting and installing all the expansion joints throughout the warehouse and even fitting in additional extra areas at the client’s request which we were also able to achieve. We installed a coloured walkway when completing the project with line markings to show it is a safe pedestrian route for employees or possible visitors within the facility. The overall result was achieved at the end of Christmas shutdown period, with us going above and beyond to meet the client’s expectation including fitting extra areas within the facility. The choice of flooring proved to be a good choice for this specific project, as Sikafloor 263SL not only proved itself to be easy to apply but also to be able to handle the demands of the facility. The final result provided the client with a very hard wearing and long-lasting solution which has met the client’s requirements for the demanding work environment in the Warrington production facility. Do you need new commercial flooring for your business space in Warrington? Contact Thelwell Flooring on 0151 200 1038 or fill out our online contact form and we’ll get back to you soon as possible.